Its good changes. I loved the menu. You should definitely call it 2.1.0, at least I would do so with my plugin. BTW why the auto clean option does not work? Few days ago my server space was full used because of this, how to get this work? And any solution for this issue coming in this version? No auto clean in 2.1.0 (or 2.0.3 ;-) ), for reasons explained in the FAQ. 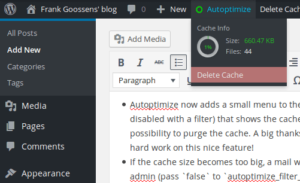 But you should now get a mail if the cache size grows to big (bigger then 0.5GB by default). 2.1.0 according to semver.org right? looks great, thank you for your work! De changes look interesting. I will test the beta on my testsite. If I notice anything worth mentioning, I wil let you know. I really love this plugin and use it on all the sites I manage! Works well on my testsite! Have tested the beta on a couple of sites, it works very well. great, thanks for the confirmation Luke! This is 2.1.0, no false modesty! Can you put a checkbox to move from adressbar the “autoptimize cache”? I really like to have clear there.